Hi everyone! I hope you are all doing great! Today's recipe is another delicious dessert, or breakfast if you want. This is an absolutely exquisite, mouth watering pound cake, this came out so rich, so soft, and moist and fluffy, it is without a doubt the best pound-cake I have ever baked. And I do bake a lot, so hopefully you will be tempted to give this one a try because it's simply delicious! Enjoy! Toss the blueberries with 2 tablespoons of the flour, then set them aside. Combine the remaining flour with the salt, baking soda and baking powder, stir well and set this aside for a minute. Mix the yogurt with the vanilla extract, the lemon zest and the lemon juice, mix well until well combine and set aside for a minute. In an electric mixer on medium-high speed, beat the butter until creamy, for about 3-4 minutes, then add in the brown sugar and continue to beat for another 3 more minutes or until you get a creamy, grainy paste. Scrape down the sides of the bowl if you need to, then add in the eggs one at a time, beating each egg for 30 seconds before adding the next one. Once the last egg is well beaten, continue to beat on high speed for one more minute. Then reduce the speed to the lowest, and add in a third of the flour mixture, followed by a third of the yogurt mixture, right after that, add in another third of the flour and another third of the yogurt, right after, add in the rest of the flour and the rest of the yogurt, continue to stir for a couple seconds, just to combine all the ingredients, DO NOT over mix! Now with a spatula, combine the blueberry mixture with the rest batter, just toss to combine everything together without over mixing! Pour the batter into the baking pan, and bake at 350º for 60 minutes or until the pound-cake is cooked. You will know the cake is cooked when you insert a toothpick right in the middle of the cake and it comes out with a bit of breadcrumbs. Transfer the pound-cake to a cooling rack and let it cool completely before glazing it. 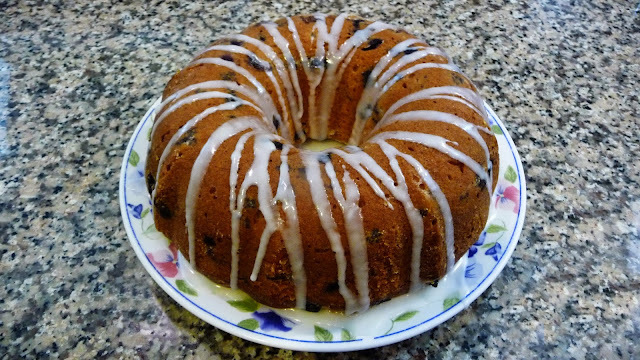 To make the glaze, combine the powdered sugar with the lemon juice and the lemon extract, mix well until you get a texture similar to sweetened condense milk, and that's it, once the glaze is ready and the pound cake is cold, drizzle the glaze all over the pound-cake, and Enjoy!